Keeping up with the trends this September! Shaded Spruce is the color of the month! Inspired from a forest of conifers, this shade surely matches some corner of your house, if not an entire room! If you choose it for as highlighting wall shade keep in mind to use contrasting and warm light shades for the furniture you place on it. It matches white windows or light beige armchairs. 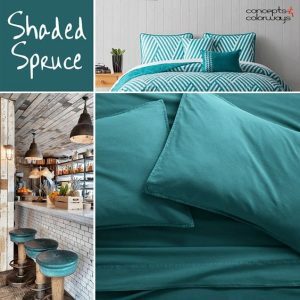 If you only plan to use it as an accentuating color for a room already painted, you can go for Shaded Spruce accessories like pillows for the couch or blankets.